This picture dates from my first visit of Teshima during the Setouchi International Art Festival 2010. 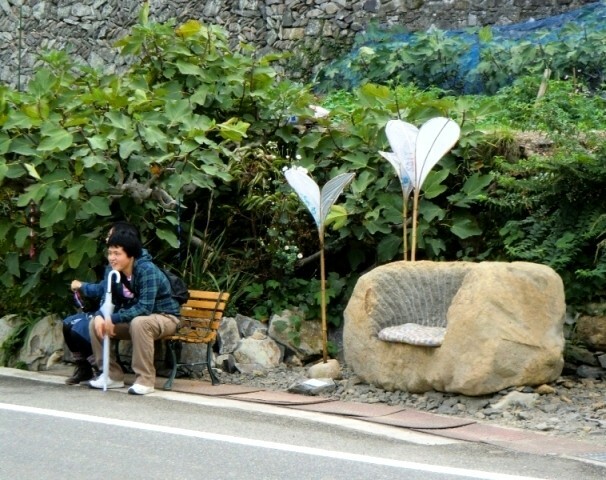 Back then, I assumed that if the bus stop had this charming appearance, it was because of the festival. However, I returned there a couple of time since and it hasn’t changed (well, the sort-of plants are gone). Actually, on the other side of the road, there is a stone-cutter (remember that Teshima used to be famous for its stones – that were used to build some castle walls here and there). I guess we found our explanation for the cool seat. If you’re interested in seeing it yourself, it’s at the entrance of Karato (or its exist, it depends where you’re coming from), right next to Particles in the Air. That’s a great bus stop!